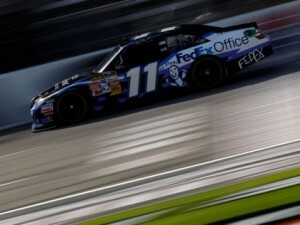 The FedEx Racing team and driver Denny Hamlin battled a loose race car throughout Saturday night’s NASCAR race at Texas Motor Speedway, and finished 15th in the Samsung Mobile 500 won by Matt Kenseth. Hamlin started 23rd and never got the track position needed to challenge for the victory at the place where he swept both Sprint Cup Series races in 2010. A long green flag run during the race’s midpoint allowed the leaders to put the #11 FedEx Office/March of Dimes Toyota one lap down, a position Hamlin couldn’t recover from. Crew chief Mike Ford directed the team members over the wall through a series of tire pressure and track bar changes during pit stops, hoping to bring the #11 machine to life. By the end of the race, Hamlin was running lap times consistent or better than the leaders, but never got the caution he was looking for. The 334-lap race on the 1.5-mile oval was slowed by just five cautions for 24 laps. With the finish, Hamlin dropped one spot to 20th in the unofficial standings following Texas, now 82 points behind leader Edwards after seven of 36 races. The Sprint Cup Series returns to action April 17 at Talladega (Ala.) Speedway.